【High Efficient】This dehumidifier machine has a great effciency for eliminating the mold, mildew, moisture, musty odors, condensation on window or wall. It removes water up to 300ml/d when at 86°F, RH80%. 【Larger Air Inlet Area】The air inlet area is 3 times as large as the same capacity on the market, Along with a 700ml large water tank, so it absorbs damp faster in the air to protect your room from mold and mildew caused by excess moisture. Also the 700ml tank connect a liquid level monitor, it will stop working when the tank is full. 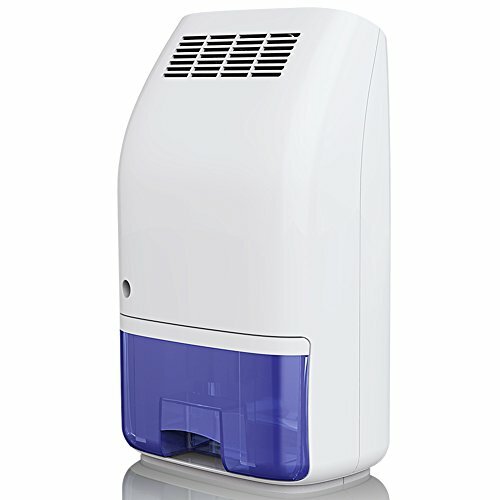 【Ultra Quiet】The silent dehumidifier is designed with peltier technology with no compressor, 35db lower noise, with no annoying sound. It runs quietly without interfering your sleep, work or study. 【Auto Shut off, Safety】It will automatically shuts off and the indicator turn YELLOW when maximum capacity reached. Do not need to worry that it will spill when you are asleep or out of home. 【Suit for Multi Place】Ideal for kitchen, bedroom, bathroom, basement, wardrobe, garage, etc. Creating a comfortable, no mildew & healthy environment for you and your family. it's suitable for spaces up to 20㎡ (215sq.ft).